California security guard Devorise Dixon says he bought a 3-piece box of tenders at a KFC in LA, but it was not what he was expecting. He then went on the Randy Economy Radio Show, to describe taking a bite. Dixon posted photos on his Facebook page, and he put the tender in the freezer. He says he returned to the restaurant with photos and his receipt. “The manager actually freaked out, confirmed that it was a rat,” Dixon said. “She apologized for it. They actually just offered me a free meal,” which Dixon said he declined. Dixon says he’s lawyering up, but shape alone is not enough to prove a chicken tender guilty of being a breaded rat. KFC told CNN “We have made various attempts to contact him, but he is refusing to either talk to us personally or through a lawyer. Nor has he come forth with the chicken piece in question for verification” which KFC offered to have done free of charge at an independent lab. Dixon claims that single bite affected his appetite. “Nauseous, woozy I can’t eat,” Dixon said. A customer has made a serious claim against KFC and refuses to cooperate in the investigation. 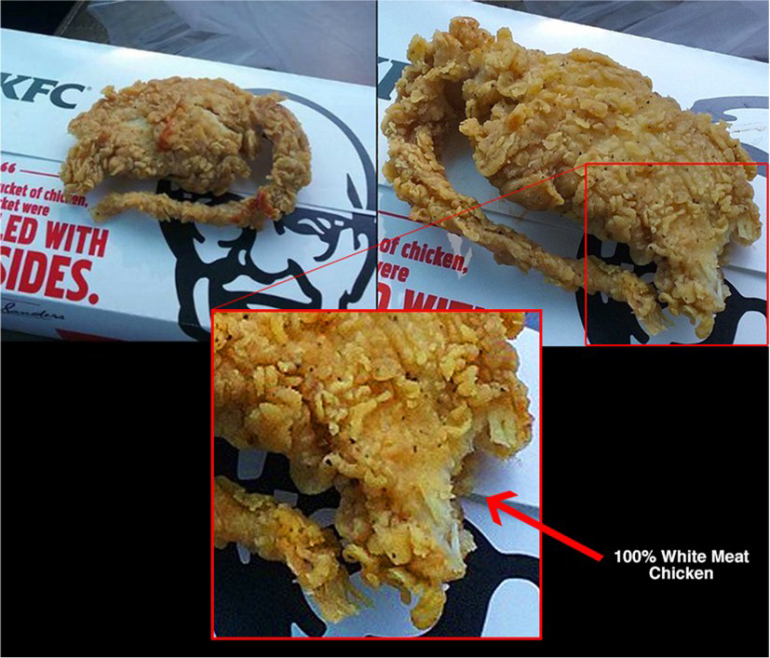 The images the customer originally posted do not include this second angle because it clearly shows it’s a piece of hand-breaded white meat chicken. Based on this, and the fact that he refuses to allow anyone to see the product, we are left to believe that he intended to deceive the public with this hoax and we are considering all options.